In three months ……. it’s Christmas!!! Three months from September 25 is December 25. I know that many of us (myself included) have a hard time planning for next week, let alone three months in advance! If you have a hard time planning in advance, do you think that maybe your customers may have the same issue? Do you think that maybe your customers need a gentle reminder that Christmas is coming? Do you think that they should be reminded to get their quilts to you EARLY so you can get them done in a reasonable amount of time? Do you want to get through your “Christmas Crunch” with a reasonable amount of sanity? NOW is the time to do this! But, HOW? Start by creating a post card or a note card. I know that many of you are scrapbookers and you can create something unique but not too complicated. If you are not a scrapbooker, then a simple card created in Publisher, Word or any other program would work. Do you realize that three months from now is Christmas! Let’s work together and get started early this year on your Christmas quilts. Now is a great time to make an appointment to bring your quilts for quilting. Bring your quilts to me before ( *specified date) and you will receive a special offer of (*to be specified). By bringing your quilts to me now, you will have your Christmas gift giving started, you won’t have to worry about the last minute rush. And, I will have plenty of time to get your quilting done for you! This is a win-win for both of us. If you have quilting friends who want to have their quilts quilted, for Christmas or any time during the year, please be sure to tell them about my quilting services. 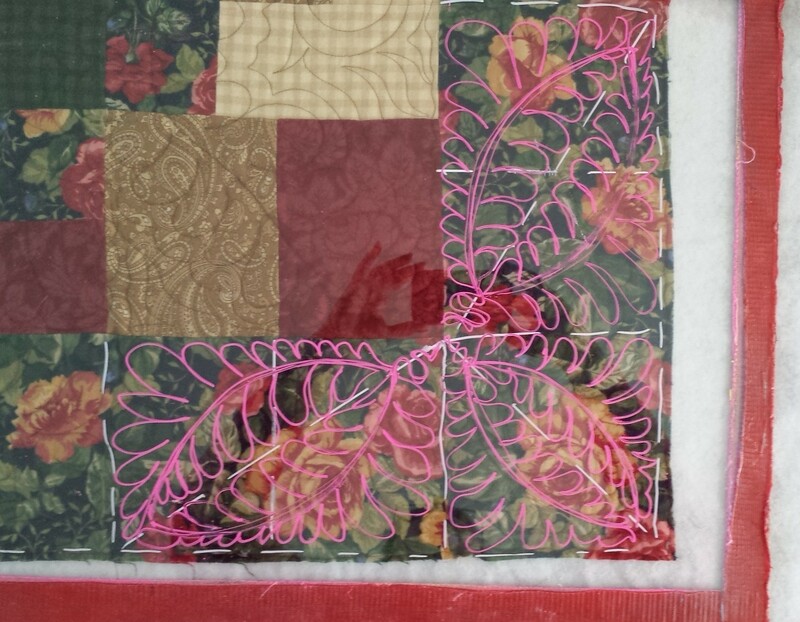 I am looking forward to working with you and quilting your quilts. To schedule an appointment ,or if you have any questions, please call me at 123-456-7890. Of course, you can write whatever you would like on your post cards or note cards. I would recommend having a special offer of some kind. I am NOT a fan of discounts – you loose too much $$ with discounts. (I will write about that in the future.) You can offer something else that won’t cost you a lot of $$. If you have a thread charge, maybe you can waive it for this special offer. If you have other fees, maybe you could waive or reduce them for this offer. Maybe you could offer an “upgrade” of some of your services. If you have multi-levels of patterns and techniques, maybe you could offer an upgrade to the next pattern level for a (slightly) reduced fee. Think about what you offer in your business as “extras” and think about how you can work that into a special offer that won’t cost you too much $$. You also need to specify a date when this special offer is good for. Being that Christmas is only three months away, I would date this special offer to the middle of October or, at the latest, early November. That gives your customers 4 – 6 weeks to take you up on this offer. Personally, a one month time frame, in this situation, would be all that I would offer. If you create your postcard/ note card on a computer and print it out, make sure you hand sign your name. If you would like, you could write (by hand) a brief note to your customer to make the card more personal. Your goal is to get this information to your customer and have them OPEN, READ and ACT on the information. An email is great, but it gets into a SPAM folder, it gets deleted or it sits in the inbox and gets forgotten. Also remember, many of our customers, especially the older ones, are NOT tech savvy and may not even have an email address! Start planning NOW to communicate with your customers so that you can have a happy and relaxed Holiday Season! Let me know your thoughts and comments. Let all of us know what your special offer is and let us know how sending out this type of card works for your business. I hate to admit it – I like reality TV shows. Not the “Housewifes” style of show, but reality shows where you can LEARN something, especially if it has to do with business! I have recently found the series called “The Profit“ on CNBC. This is a show where a multi-million $$$ business person, Marcus, goes into a struggling business, invests his own money in the business, and totally turns around the business. Of course, there are dysfunctional employees, clueless business owners, people who don’t want to change things, and all the other “stuff” associated with reality TV shows. What I DO like about this show is that they show “the numbers.” They get into the nitty-gritty of how much things cost, not just cost of the product but also how much it costs to keep the business running, etc. To me, this is what makes this program different. In one episode, they even bring in a Forensic Accountant (CPA) to look over some very interesting bookkeeping. I never knew such a thing existed! Even though you are running a small (compared to the program) business, I do believe that you will see some parallels between the businesses shown and your business. Post a comment about what you found in this series that “connects” with you about your machine quilting business.